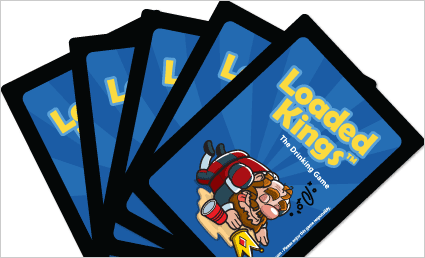 Loaded Kings The Drinking Card Game - Similar to Kings Cup, Kings, Ring of Fire, and Circle of Death! Similar to Kings Cup and Ring of Fire, Loaded Kings is one of the nation's most popular drinking card games, and the ultimate party companion! Loaded Kings provides you with quirky artwork and rules that are printed on 100% waterproof plastic cards - no more worrying about soggy cards! 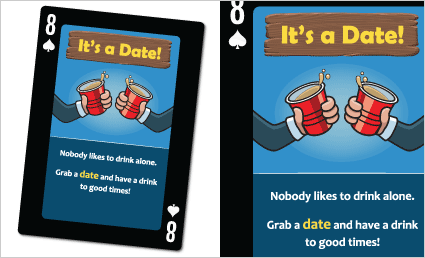 Backed by a 30 day money-back satisfaction guarantee, we present to you a timeless drinking card game with a brand new twist. Order your deck tdoay! 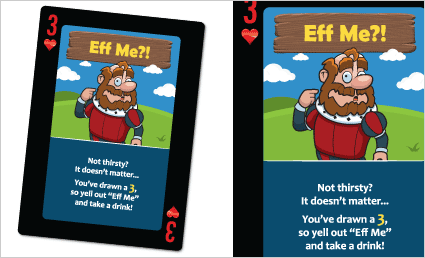 Printed rules on each card - no more having to look up rules or arguing over who's right! Plastic playing cards that are 100% Waterproof. Poker-sized - 2.5in. x 3.5in. Standard Suits & Numbers printed on each card so you can enjoy any of your other favorite card games! © 2016 Loaded Kings - The Drinking Game™. All Rights Reserved. All logos are property of their respective companies. 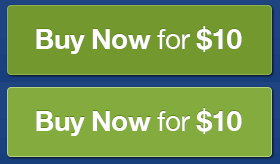 Please enjoy this game responsibly.